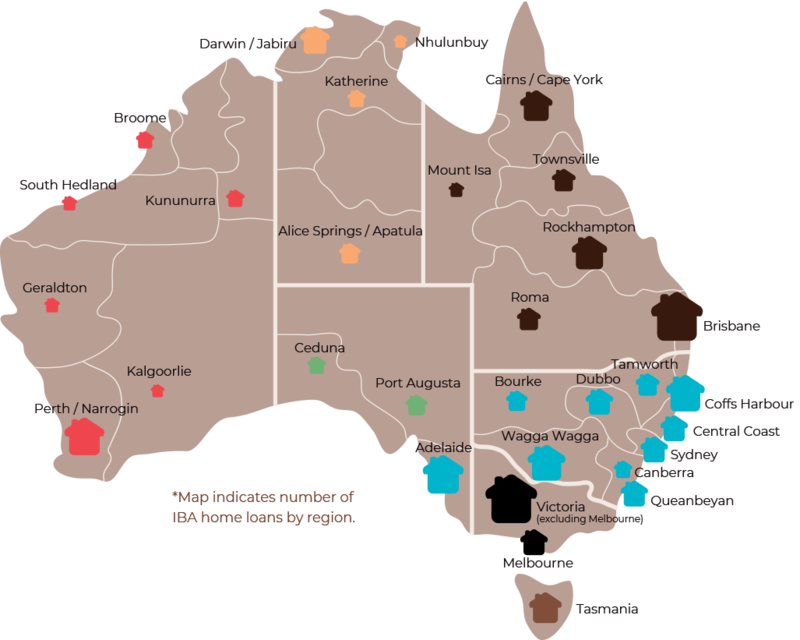 IBA’s Housing Solutions’ program is one of the longest standing programs successfully supporting self-management and economic self-sufficiency for Aboriginal and Torres Strait Islander people. Over the life of the program, more than 18,500 Indigenous families have been supported into home ownership, equating to more than $2.1 billion in assets in Aboriginal and Torres Strait Islander hands. In 2017–18, IBA succeeded in making home ownership a reality for 913 Indigenous families, 874 of which were to were first home buyers (95%) and low income earners (96%). This is a remarkable achievement which significantly exceeded the annual target of 580 housing loans and the program’s five-year average of 554 home loans. This equates to over $310 million in home lending (more than 13 times the Commonwealth contribution of $22.85 million in capital), making it IBA’s highest ever year of home lending on record. 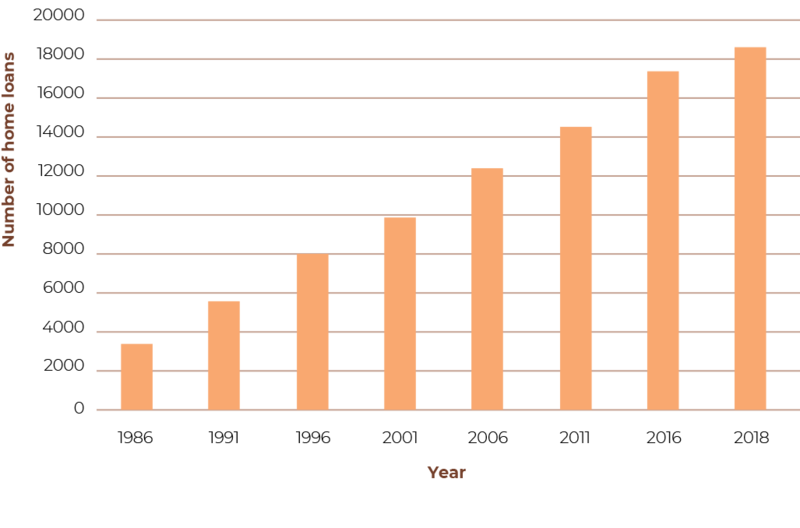 We achieved this growth through more structured engagement and streamlining application processes and innovations. Online expressions of interest and housing loan applications were introduced through the IBA website. IBA’s capital base for home lending consists of its housing loan portfolio comprising 5,037 loans valued at nearly $1.2 billion and the bank balances available for home lending. From 2016–17 to 2017–18, we achieved a net portfolio increase of 467 housing loans (10%) and $145 million (14%) portfolio value. In recognising the importance of reducing the barriers to home ownership in remote Australia, IBA broadened the eligibility for its Remote Indigenous Housing Loan and grant assistance. This is now available to applicants from all communities classified as remote or very remote under the broadly accepted Accessibility and Remoteness Index of Australia (ARIA). As a result, IBA was able to support 67 remote or very remote Aboriginal and Torres Strait Islander families to realise their dream of home ownership in 2017–18 compared to 50 in the previous financial year. This year, IBA exceeded its performance target to transition or support 4.5% of customers into mainstream lending arrangements with 7.2% of IBA’s loan customers establishing sufficient equity and credit histories to successfully refinance with mainstream lenders. Paul and Korinna Walker submitted an Expression of Interest for an IBA home loan in April 2017 when they were advised that their rental property was being sold. The Walkers had rented for 20 years and decided that they wanted to build a home in Maryborough QLD to provide a stable base for their family. They have four children so saving for a deposit wasn’t easy. Being first home owners, they were able to use the First Home Owner’s Grant to provide the required equity. Building a home was challenging at times but well worth it. The Walkers moved into their new home just before Christmas 2017 and it has been a dream come true for them. ‘We never thought that we would ever own our own home and to actually own our own home is just an amazing feeling. When we walked in with the keys in our hand it was a great weight lifted off our shoulders— we were very excited, and we were very emotional. This has brought our family together, we eat meals together, we have room to stretch out and move, we are more of a family now than we ever have been. This house has made our family perfect. Now two of the children are getting to an age where they could move out shortly and having our own home we can say you’re always welcome home, no matter what happens in life we love you and you’re always welcome back’.